We are happy to announce that the Executive Committee appointed Sharon Eubanks Director of the Office of Legislative Legal Services. Sharon has served the office and the General Assembly in many capacities during her 31 years with the OLLS, applying her cleverness to serve the General Assembly. As of October 4, she broke new ground as the first woman to lead the OLLS. 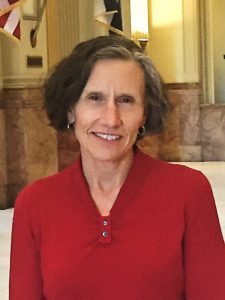 Sharon started her career with the OLLS on September 1, 1986, as a legislative attorney drafting in the areas of finance, education, and local government. She quickly rose to the position of assistant team leader and, in 1996, was appointed the team leader of the Government team, supervising four attorneys and three legislative editors working in the areas of taxation, government finance, state and local government, infrastructure, elections, and school finance. When the Taxpayers’ Bill of Rights (TABOR) passed in 1992, Doug Brown, Director of the OLLS at the time, knew he would need in expert in all things TABOR. Knowing Sharon’s already considerable expertise in tax issues and her analytical turn of mind, Doug called on Sharon to lead both the office and legislators in understanding and implementing TABOR. Today, she is recognized both within and outside the capitol as one of the leading TABOR experts in the state. In the late 1990s, Sharon partnered with Debbie Haskins to oversee the rule review process in the office. Additionally, Sharon served as the OLLS liaison to the Joint Budget Committee for several years, assisting the committee with legal questions arising through the budget process, overseeing drafting of JBC bills, and reviewing long bill footnotes. For several years, Sharon has also been one of the office’s experts on ethics issues. Over the years she has helped staff House and Senate committees on ethics. In addition, she has presented many programs—within the office and for the National Conference of State Legislatures—on the ethical duties of legislative staff and the attorney-client relationship between staff and the legislative institution. Sharon is also one of the office’s foremost experts on the legislative rules. During the term of our previous Director, Dan Cartin, Sharon was the liaison to the Senate to assist with rule issues that arose during floor work and, upon request, to consult with leadership. This experience will be especially helpful in her role as Director. Sharon brings many strengths to her role as director in addition to her years of experience with the office. Sharon is thoughtful, meticulous, hard-working, solidly nonpartisan, and fiercely committed to serving and protecting the General Assembly. She is also helpful and supportive to both legislators and her colleagues, having served as a mentor to many attorneys in the office. Above all, Sharon is dedicated to ensuring that the OLLS continues to provide excellent work products and the highest possible level of service to the General Assembly. As the OLLS nears its fiftieth anniversary, we are confident that Sharon will provide the same high-quality leadership we have enjoyed since 1968, guaranteeing that we remain the best legislative legal services office in the nation.